Whether its reading a good book on a rainy day or hosting out of town guests, this contemporary style daybed with trundle is the perfect piece to complete your home. 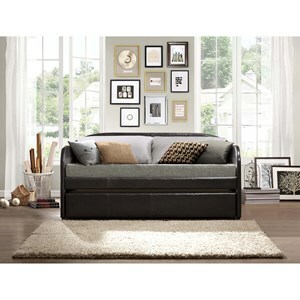 Clean vertical and horizontal define this modern piece while a black vinyl allows peace of mind when it comes to stains. 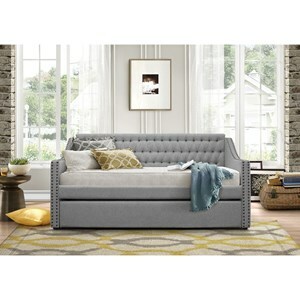 The Daybeds Contemporary Adra Daybed with Trundle Unit by Homelegance at Hudson's Furniture in the Tampa, St Petersburg, Orlando, Ormond Beach & Sarasota Florida area. Product availability may vary. Contact us for the most current availability on this product. 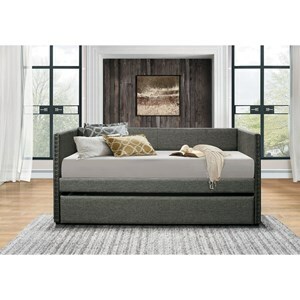 Browse other items in the Daybeds collection from Hudson's Furniture in the Tampa, St Petersburg, Orlando, Ormond Beach & Sarasota Florida area.